Robert I of Bar (8 November 1344 – 12 April 1411) was Marquis of Pont-à-Mousson and Count and then Duke of Bar. He succeeded his elder brother Edward II of Bar as count in 1352. His parents were Henry IV of Bar and Yolande of Flanders. When Robert was less than a year old, his father died and his elder brother, Edward II of Bar, became Count of Bar under their mother's regency. As neither Robert nor Edward had a strong constitution, Yolande obtained a papal dispensation from Clement VI to allow them to eat meat during periods of abstinence. When his brother Edward died, Robert was still only seven years old and political problems associated with his mother's continued position as regent had arisen. Yolande was on the point of remarrying to Philip of Navarre, count of Longueville, a member of the Navarre family which was attempting to claim the French crown from John the Good. Joan of Bar, Robert's grandaunt, made known to the king that she was ready to replace Yolande and assume the regency. The Parliament of Paris, by decree of 5 June 1352, declared that the county was under the king's control. John the Good then entrusted the regency to Joan on 27 July of that year. Yolande initially renounced the regency, but then went back on her decision, levying troops to fight Joan. John the Good intervened to force Yolande to renounce the regency again on 2 July 1353. In 1354 the County of Bar was raised to the status of duchy by King John the Good. That same year another possession, Pont-à-Mousson, was raised to a marquisate by Emperor Charles IV. Subsequent emperors recognised Robert's ducal title and his state's right to a vote in the Imperial Diet. It is unclear if Robert was regarded as a Peer of France after becoming duke. The defeat of Poitiers and the capture of John the Good in 1356 deprived Joan of John's support and Yolande retook the regency. Robert was knighted in December 1356 and declared of age on 8 November 1359. He assisted at the coronation of Charles V of France at Reims on 9 May 1364, then at that of Charles VI of France on 4 November 1380. During Charles V's reign he fought in several engagements in 1374 during the campaign to eject the English from Normandy. In 1401, Robert ceded his duchy to his son Edward, but reserved the usufruct on it, bypassing his grandson Robert (son of Henry of Bar). The younger Robert unsuccessfully opposed this in the parliament of Paris that ran from 1406 to 1409. Charles VI's madness put him under the control of the Duke of Orleans and Duke of Burgundy. The elder Robert supported the duke of Orleans, and after that duke's assassination was more and more inclined to remain within his duchy. In his later years he suffered from attacks of gout that prevented him from walking. Yolande of Bar, (1365 †1431); in 1380 married John I of Aragon (1350 †1396). Henry of Bar, (1362 †1397), Marquis de Pont-à-Mousson, seigneur de Marle; in 1384 married Marie de Coucy. Taken prisoner at the Battle of Nicopolis and died of the plague. 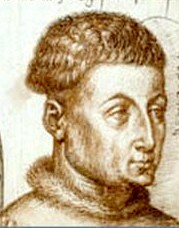 Philippe (1372 †1396); also killed at the Battle of Nicopolis. Charles (1373 †1392), seigneur de Nogent-le-Rotrou. Edward III of Bar (1377 †1415), Duke of Bar; killed at the Battle of Agincourt. Louis I, Duke of Bar (between 1370 and 1375 – 26 June 1430); Bishop of Verdun, cardinal. Yolande the younger (†1421); in 1400 married Adolf, Duke of Jülich-Berg (†1437). John of Bar, seigneur de Puisaye (1380 †1415), seigneur de Puisaye; killed at the Battle of Agincourt. Bonne (†1436); in 1393 married Waleran III of Luxembourg, Count of Ligny (1357 †1415), Count of Ligny and of Saint-Pol. Jeanne (†1402); in 1393 married Théodore II Paléologue, Marquis of Montferrat (1361 †1418). ^ Brachmann 2011, p. 156. ^ a b Brachmann 2011, p. 155. ^ d'Arras 2012, p. 234. ^ Lanz 2002, p. 59-60. ^ a b Vaughan 2009, p. 264. ^ Souchal 1974, p. 124. ^ Brachmann 2011, p. 158.
d'Arras, Jean (2012). Melusine; or, The Noble History of Lusignan. Translated by Maddox, Donald. The Pennsylvania State University Press. Brachmann, Christoph (2011). "The Crusade of Nicopolis, Burgundy, and the Entombment of Christ at Pont-a-Mousson". Journal of the Warburg and Courtauld Institutes. 74. Poull, Georges (1994). La Maison souveraine et ducale de Bar (in French). Presses universitaires de Nancy. Lanz, Eukene Lacarra, ed. (2002). Marriage and Sexuality in Medieval and Early Modern Iberia. Routledge. Souchal, Geneviève (1974). Masterpieces of Tapestry from the Fourteenth to the Sixteenth Century. Translated by Oxby, Richard A.H. Metropolitan Museum of Art. Vaughan, Richard (2009). Philip the Bold, The formation of the Burgundian State. The Boydell Press. René of Anjou, also known as René I of Naples and Good King René, was count of Piedmont, Duke of Bar (1430–80), Duke of Lorraine (1431–53), Duke of Anjou, Count of Provence (1434–80), briefly King of Naples, titular King of Jerusalem (1438–80) and Aragon including Sicily, Majorca and Corsica (1466–70). Rudolph, called the Valiant, was the Duke of Lorraine from 1329 to his death. He was the son and successor of Frederick IV and Elisabeth, daughter of Albert I of Germany. Though he was but nine years of age when his father died and he succeeded to the duchy under the regency of his mother, he was a warrior prince, taking part in four separate wars in Lorraine, France, Brittany, and Iberia. He was killed at the Battle of Crécy. Isabella was suo jure Duchess of Lorraine, from 25 January 1431 to her death in 1453. She was also Queen of Naples by marriage to René of Anjou. Isabella ruled the Kingdom of Naples and her husband's domains in France as regent during his imprisonment in Burgundy in 1435-1438. The County of Bar was a principality of the Holy Roman Empire encompassing the pays de Barrois and centred on the city of Bar-le-Duc. It was held by the House of Montbéliard from the 11th century. Part of the county, the so-called Barrois mouvant, became a fief of the Kingdom of France in 1301 and was elevated to the Duchy of Bar in 1354. The Barrois non-mouvant remained a part of the Empire. From 1480, it was united to the imperial Duchy of Lorraine. Philip I, Duke of Brabant, also known as Philip of Saint Pol, was the younger son of Antoine, Duke of Brabant and Jeanne of Saint-Pol, and succeeded his brother John IV as Duke of Brabant in 1427. He had already been given Saint-Pol and Ligny as an appanage on the death of his grandfather, Waleran III of Luxembourg, Count of Ligny, in 1415 at the Battle of Agincourt. Marie of France was the sixth child and second daughter of John II of France and Bonne of Bohemia. Yolande II or Yolande of Nevers, was the daughter of Odo of Burgundy, and Matilda II, Countess of Nevers. Marie I de Coucy was Dame de Coucy and d'Oisy, and Countess of Soissons from 1397. She succeeded to the title of suo jure Countess of Soissons, on 18 February 1397, upon the death of her father, Enguerrand VII de Coucy. In addition to her titles, she also owned numerous estates in North-Eastern France. She was the wife of Henry of Bar, and the granddaughter of King Edward III of England and Philippa of Hainault. Theobald II was a count of Bar. He was the son of Henry II of Bar and Philippa of Dreux. He became count of Bar when his father was killed in the Holy Land on 13 November 1239 in Theobald of Navarre's Crusade, but news of Henry's death only reached him at the start of 1240. As Theobald was still a minor, his mother ruled as regent until 17 March 1242. Theobald's own children included his successor Henry III and the bishop Reginald of Bar. Jeanne de Bar, suo jure Countess of Marle and Soissons, Dame d'Oisy, Viscountess of Meaux, and Countess of Saint-Pol, of Brienne, de Ligny, and Conversano was a noble French heiress and Sovereign Countess. She was the only child of Robert of Bar, Count of Marle and Soissons, Sire d'Oisy, who was killed at the Battle of Agincourt when she was a baby, leaving her the sole heiress to his titles and estates. In 1430, at the age of fifteen, Jeanne was one of the three women placed in charge of Joan of Arc when the latter was a prisoner in the castle of John II of Luxembourg, Count of Ligny, Jeanne's stepfather. The title Count of Vaudémont was granted to Gérard 1st of Vaudémont in 1070, after he supported the succession of his brother, Theodoric II, Duke of Lorraine to the Duchy of Lorraine. Counts of Vaudémont served as vassals of the Dukes of Lorraine. After 1473 the title was held by the Duke of Lorraine and was bestowed on younger sons of the Duke. It was later restyled "Prince of Vaudémont".